The Chauvet GigBAR 2 adds to the original ultimate pack-and-go 4-in-1 light by including UV in its pars and strobes for increased color mixing and effects. 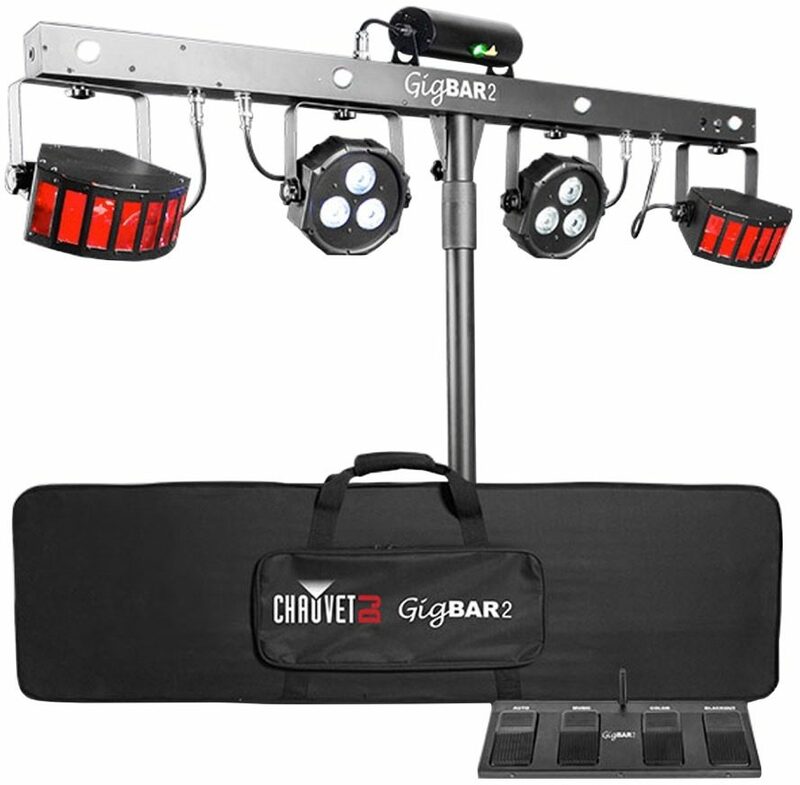 GigBAR 2 includes a pair of LED Derby fixtures, LED pars, a laser, and 4 high-power, LED strobe lights all mounted on one bar. 4 individually adjustable and interchangeable heads let you cover any room or stage. GigBAR 2 strobes allow you to create exciting chase and slow-motion effects and the adjustable red and green laser scatters hundreds of bright dots and beams in all the right directions. Phenomenal built in automated and sound-activated programs are on board that include all 4 effects to make one complete show and you can easily control the unit from the display, IRC, wireless foot switch or DMX to take your gig to a higher level. Master/slave multiple units under the control of a single IRC or wireless foot switch and save time running cables and extension cords by power linking multiple units. GigBAR 2 is ready for every application using the included mounting brackets to attach to truss. Get in and get out quickly with the included tripod, wireless footswitch and FREE carry bags. - Includes tripod, wireless footswitch, IRC-6 wireless remote, power cord, warranty card, user manual, and carry bags. Overall: These thing will bring up your DJ or live show up a few notches! I bought it as a addition to my old lights and truss that is huge about 10ft wide and no movement just flash lighting since moving lights are so expensive I went with the Gigbar. I tried it at home loved it and decided to risk just using it as a primary...Did my first gig with it WOW lit up a 100 by 50 banquet room with a 20ft ceiling this thing was beautiful for now I am ok with one but seriously considering running 2! Buy it NOW you will not regret it! 30 of 30 people (100%) found this review helpful. Did you? 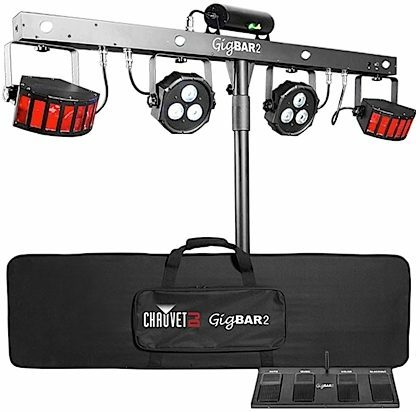 Overall: I ordered one of the original GigBar when they first come out, and loved it, I now have that one and one of the GigBar2, they have replaced my truss system and all the lights I had to put on and take off each event. These have made my life so much better and my back loves me for it.